The Damascus Christian girls basketball team could not wait for the clock to show zeroes in Tuesday's 38-34 win over Country Christian — the reigning 1A state champs. The host Eagles appeared to be in command after a wild shot that not even the Harlem Globetrotters could pull off. Leading by four heading down the stretch, Damascus sophomore Noelle Wakefield found herself with an open look behind the arc in front of the team's bench. The ball clipped the back iron, spun high above the basket, took a hop off the top edge of the backboard and fell through the net. The nearest official waved off the basket, claiming the ball had gone out of play, but the sideline referee rushed in and correctly ruled the basket good. "It's only out of play if the ball goes over the backboard — it was just one of those weird shots that happen in basketball," Damascus coach Dave Wakefield said. "Those 3s are really valuable, especially in a game where there are only a few of them in a game." "I was scared they weren't going to call it in, and that would have changed the game. We really needed those points," Noelle Wakefield said. Damascus led 36-29 with 2:10 to play. Country Christian wasn't ready to board the bus just yet. Allison Burruel answered with a 3 at the other end, and moments later Lizzy Grandle poked the ball loose and sent a pass over the top to Sarah Phillips for a layup. The Cougars were within two with 1:19 to play. Damascus showed its youth, only two upperclassmen, down the stretch. An over-and-back violation, a charging foul and a missed free throw kept the door open for a Cougars' comeback. But Country failed to take advantage. A missed shot in the lane, and a 3-pointer off the back of the rim kept the score frozen. The Cougars called timeout with 30.3 seconds left to set up a play. Forget overtime, Country coach Russ Halverson was going for the win. Phillips started a drive to the right side before finding Grandle open in the corner for a winning 3 that appeared to be on target only to rattle the rim and pop out. Country's fourth and final chance was nullified by a traveling violation after a stutter step near the left side of the hoop. "We got sloppy with the ball at the end, part of that is our youth, but something we need to work on," Dave Wakefield said. "But we did an excellent job defensively, crashing the boards and not giving up easy looks." Damascus Christian rookie Emily Powers stood at the free-throw line alone, her teammates all back near midcourt to play defense, with a chance to clinch the game with 7.1 seconds left. "It was really scary," Powers said. "I just prayed that they would go in." Her first attempt rattled the rim, took a hop on the heel and dropped through. Her second foul shot swished through. Game over. The win splits the season series between the two teams with a third showdown expected in the title game of the Valley 10 tournament next month. "The first time around, they just hammered us, so this was a big one for us tonight," Dave Wakefield said. 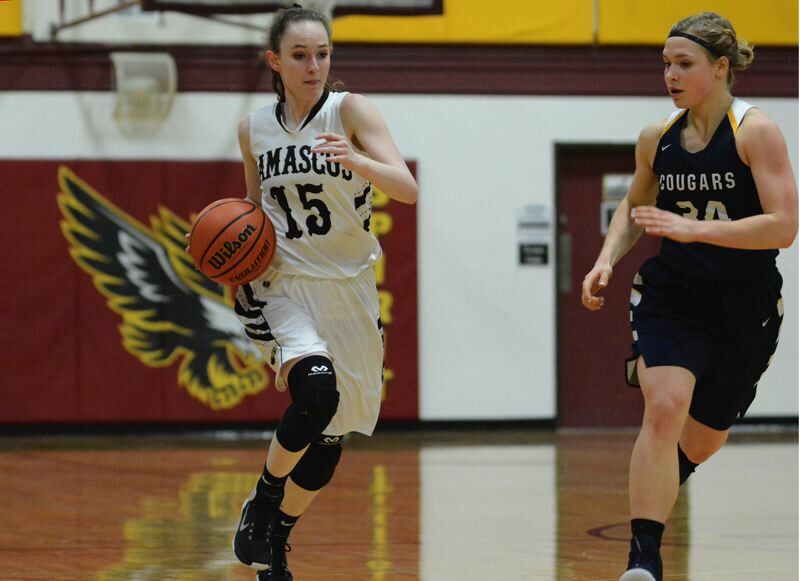 The teams traded the lead twice in the first half, but the Eagles were never down after Wakefield fired an inbounds pass that found Ally Love for a layup late in the second quarter. 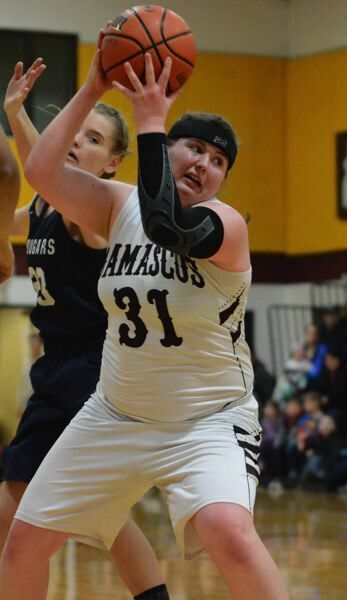 Country's defense was focused on stopping Damascus center Tory Webb, but she still got open in the post consistently and finished with a game-high 14 points, despite picking up her third foul midway through the second quarter. "I made a couple dumb fouls, and now I know for next time," Webb said. "You just have to know what you can and cannot do and play within those limits." Country Christian (34) — Lizzy Grandle 10, Phillips 9, Syphard 5, Burruel 5, Sandberg 3, K. Halverson 2, M. Halverson. Damascus Christian (38) — Tory Webb 14, Wakefield 10, Powers 8, Love 4, Hale 2, Patrick, Manning, MacGibbon.